The Cardinal-TA is a new addition to our Time-Aligned (TA) speakers. It is a compact 2-way bass reflex with an internal volume of 15 liters. Two outstanding drivers are used in this model, a Peerless 830874 and the Seas 27TDFC. The 830874 is a 6.5″ mid-woofer with a Poly Cone. I was astounded when I first heard this woofer. The bass is superb. Full of detail. It has a very fast attack with fantastic damping. Mid-range is crystal clear, close to my cherished Carbon Fiber Audax HM130CO. I never expected a Peerless to sound so good. I was sorely disappointed with my 8″ Nomex 830869 so this came as a huge surprise. The Black plot in Fig 1 is the RAW response of the Peerless 830874 in a 15 liters box with a baffle width of 8.5″. Due to room limitations, measurements below 500Hz are Nearfield. The effects of Baffle Step can be clearly seen by the 6dB rise at 500Hz. Obviously, this needs attention otherwise the speaker will sound too bright and forward. A woofer of this quality demands a tweeter better than the XT25TG30. Out came my favorite Seas 27TDFC. The Red plot in Fig 2 is the Seas tweeter whereas the Blue plot is of the Peerless 830874 woofer. Fig 3 is the summed response of the Peerless 830874 and the Seas 27TDFC. No smoothing is applied from 500Hz onwards. Measurements below 500Hz are in Nearfield. In this frequency response, the Peerless and the Seas are time-aligned. In Fig 4, the Violet plot is with the Seas 27TDFC wired in Reversed Phase. A very deep and sharp null can be seen. The 3kHz tip of the null is at -32dB below the fundamental. You will only get this kind of null when the two drivers are time-aligned. Absolutely fantastic. This is the fastest, most realistic sound I’ve ever gotten. The designers of this Peerless 830874 got it spot on with this woofer. The Cardinal-TA is close to high-end sound but without the sky high cost. The only speakers I have that has this kind of sound quality is the Starling-II and Starling-TA which use a Seas ER18RNX that cost double the 830874. 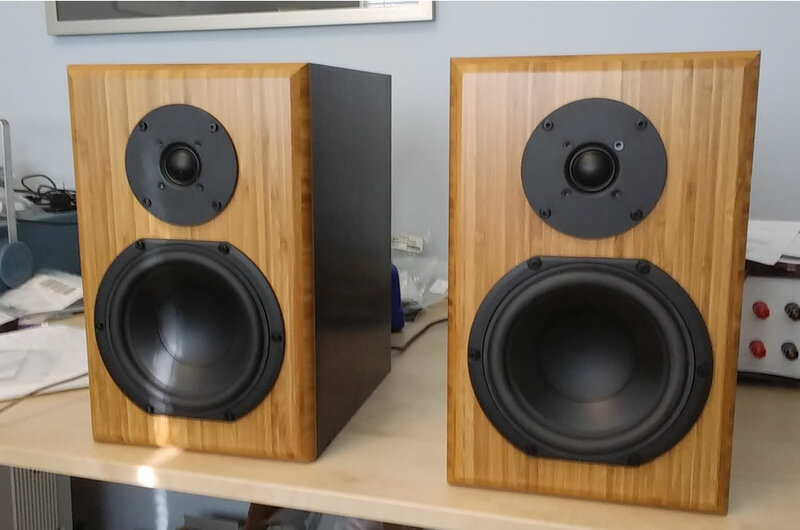 With some reluctance, I disassembled my Cardinal-TA speakers so they could be properly finished. They are now complete. Attached is a picture. Sound quality continues to amaze me given the modest cost of the drivers. The speaker enclosure turned out better than expected. My table saw and router seemed to handle bamboo plywood quite well. with full-range drivers such as the Alpair 6.2: there’s no crossover so you can spend your limited speaker-building funds on just a good, single driver. You won’t get much bass from an Alpair 6.2 though. Your Falcon-II seems to have an outstanding mid-range and might soon be on the top of my project list.